I came to Druidry after almost two years of pre-initiation study with a Gardnerian Wicca coven that turned out to be incompatible with my mental health issues. I was very upset with the loss of my coven and found I couldn’t practice Wicca on my own in a way that I found satisfying, so I needed something to challenge me spiritually in a way that would be different from what I had been doing before (since that was no longer something that was going to be an option). After a few months of reading everything I could get my hands on about ADF, I joined and started the Dedicant Path immediately, with the idea that I would have the best chance of really giving this new mode of operation a try if I worked on their introductory study program. I didn’t make an “official” first oath, but I promised myself that I would finish the Dedicant Path within a year of starting it, and that I would use that time of spiritual searching to decide if this had the potential to be a lifelong path for me. I also went in hoping to have a Grove to learn from and with, but that hasn’t worked out well for me. My efforts to get in contact with the local protogrove have not been productive, and their only meetings take place at a private home (and I am uncomfortable having my first meeting with people I’m intending to do ritual with taking place in a stranger’s house). Their hearth culture is also very different from mine (at least as I am currently practicing), so I have contented myself with finding my Druid community online, especially with the support of my Regional Druid and the ADF mailing lists. It is curious that I did so poorly practicing as a solitary Wiccan, but have settled into practice as a solitary Druid. I think it is the community online and the structure of the Dedicant Path that has helped me stay on track. Having something that I am pursuing as an academic and spiritual study has done a lot of good, and is encouraging me to continue my studies in ADF. I started this path fairly certain that I was going to practice in a Celtic hearth of some kind, but after only one High Day, started looking elsewhere – the mythology just wasn’t clicking with what I felt I should be doing. I have since done several Gaulish rituals that went very well, but settled into a Norse hearth culture, with a newly developing transition into a more Anglo-Saxon based style. This was a totally new mythology for me – I am not even a reader of comics, so I didn’t have comic books or movie mythologies to contend with. My first experience was through a good friend who is a practicing Vanatruar. He was telling me of his relationship with Freyr and Freyja (particularly Freyja) and I decided to give the Norse hearth a try just to see how it felt. I had some serious trepidation about the change, because there are some really unsavory things that are promoted in the name of Norse Mythology, but I figured going through the ADF side of things would protect me from a lot of that backlash. I read my Hearth Culture book, HR Ellis Davidson’s Gods and Myths of Northern Europe, and set about learning about the Norse Gods and their culture. As time went on, though I did make an initial contact with Odin, I found myself drawn very strongly to Freyr, and I had a personal encounter with him in a meditation that put me on the path to working with him in a way that I hope will become one of patronage. While I haven’t had any really close experiences with Him regularly, I feel that relationship will deepen with time and practice. 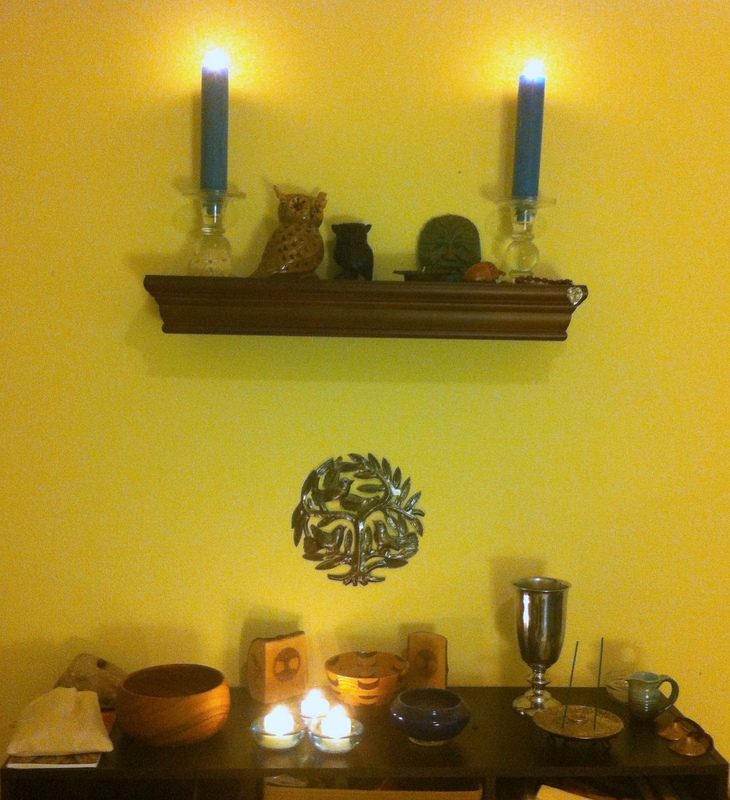 I have my altar set up in an ADF style (with a few nods to my Norse hearth yet, since I haven’t found any statues that I like) and I light incense and meditate there regularly. I utilize the ADF methodology of Threes as an integral part of my worship – Three Worlds, Three Hallows, Three Realms, Three Kindreds, and though the Norse Mythology claims nine worlds, I connect them all with the World Tree (with the Underworlds Below and the Upperworlds Above), so I don’t see much of a disconnect. I find the Three Kindreds belief system works particularly well for the Norse, since they strongly believed in Ancestor worship, in a proliferation of land and nature spirits in the world around them, and in a full pantheon of Gods with different functions. Recently, I’ve found myself being drawn toward the Anglo-Saxon strain of Germanic paganism, though I have other aspects of my practice that fit into more of a pan-Germanic worldview. I am cultivating a relationship with Njord and Nerthus, who are not talked about in the Anglo-Saxon sources I’ve seen so far, and I have a strong relationship with my Disir/Matronae/Ancient Mothers, whose cult spanned most of Germanic Europe at various times. I think this will remain something that is somewhat fluid about my practice, since there is a lot of overlap between these cultures, and that doesn’t really bother me. What draws me to the Anglo-Saxon hearth is the similarities to things I understand (being an English speaker) and that it is the culture of my ancestors, some of whom date back to pre-Norman Britain. I will be trying, as I move forward, to add more Anglo-Saxon flavor to my rituals, hopefully through writing more ritual material for my own use. Overall my transition into the Norse hearth was both immediate (ritually) and slow (personally) – it’s taken me awhile to get to know this new group of deities and their surrounding customs. I work primarily with the Vanic deities, specifically Freyr (or Ing-Frey), and I would like to have a better relationship going forward with His sister and father (and possibly mother – Nerthus is a goddess that I find extremely intriguing, and my research about her has only increased that intrigue). I like that she is a sort of “Earth Mother”, and that she can fill that function in ADF ritual, while still remaining a separate functioning Deity in her own right. Some recent articles I’ve read have put her name as a linguistic cognate to Jord (the other “Earth Mother” of the Norse), and I am fascinated by her role in the hierarchy of Deities, as well as her domains of holiness and peacemaking. I have kept to my informal first oath, writing this penultimate essay of the Dedicant Path before I have completed the final High Day of my year of observations, and I am very proud to have stuck to it. In a way, it was a promise I made to myself, to give myself this time of searching and exploration of something different. In some ways I feel like I haven’t learned much at all, but then I am reminded of just how far I’ve come in a year, and how many new paths are open to me now. I don’t know for sure if ADF will be my path forever, but I am finding myself increasingly comfortable here. There is a great deal of tolerance for variation, an emphasis on scholarship (but also an emphasis on practice, when scholarship falls short), and I am drawn to the practice of ADF style rituals. I think the poetry of those rituals makes them work well – even if they seemed very strange to me at first, coming from a traditional Wiccan worldview. While I have not always fully embraced the views that get presented as “ADF’s”, I like that if you ask three Druids a question, you should expect six answers. The balance of scholarship and personal practice/personal gnosis is one that I think I can find myself at home in as I continue this path. I am drawn towards the Initiates Path at this point, though I do not know if I will start on that coursework immediately. I crave a deep, meaningful spirituality, as well as meaningful community and spiritual interactions with other people – something that can be hard to get as a solitary. I hope through ADF’s embrace of technology, through my ability to volunteer to help in the organization, through learning more and mentoring other new Druids on the Dedicant Path, and through furthering my own spiritual practice, I can find my own place here in this corner of Neopaganism. Historically this holiday was celebrated in most of Northern Europe, especially the British Isles, Scandinavia, and the Germanic lands, where celebrations included bonfires and the picking of golden-flowered plants, supposed to have miraculous healing powers. In the Scandinavia, where the sun sets very late and rises very early resulting in extremely long days, the Sun is the central figure, as well as the lit bonfires and celebrations of community. People frequently danced around (and through!) bonfires as a ritual of protection, as well as driving cattle through the fires to protect them. The strength of the Sun makes the crops grow, and there is a great deal of promised bounty as people tend the crops and prepare for the upcoming harvest. In the Neopagan myth, this is the time of the second battle between the Holly King and the Oak King, where the Holly King defeats the Oak King (who has reigned since Yule) and will then rule until December when the two will battle again. This begins the “Dark” half of the year, where the Sun’s power wanes and the days grow shorter again until the cycle begins anew at Yule. Bonfires are a very common method of celebrating this high day, often accompanied by all night vigils. This seems to be both an honoring of fire and a warding against wildfires, which are at their most dangerous during the hot dry summer months. The spirits of the land are also important at this time. Most central, however, is honoring the Sun at her (or his) strongest point in the year. I usually make a special point to watch both the sunrise and the sunset on Midsummer, and always have a “bonfire” in my charcoal grill, where I make offerings to Sunna, who is at her brightest (and most destructive!) at this time. As a tropical Pagan, my relationship with Sunna is one of deep respect as well as joy, for while it is sunny here most of the year, and I love basking in her warmth, it is very dangerous to underestimate the power of Sunna in summer, especially on exposed skin.